Kate Hoey said that Ireland needed to be more positive about Brexit. A mock customs post set up by anti-Brexit campaigners at Ravensdale, Co Louth. A UK LABOUR MP has said that Ireland would have to pay for any hard border infrastructure between the north and south of the island, and that she “wouldn’t be surprised” if Ireland left the EU in the next few years. Speaking on BBC Radio 4 this morning about Brexit and the current impasse over border solutions for the north and south of Ireland, Kate Hoey said that Ireland needed to be more positive about Brexit. She was taking issue with the Irish government position that a practical solution around how a physical border (or lack of border) needed to be reached before the Brexit talks could progress to the next stage. 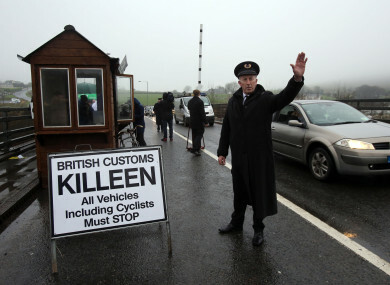 Ireland and the EU want further clarification and assurances from the UK over the border issue, before tense negotiations progress to issues of trade. The UK, meanwhile, wants to move onto trade matters, saying that border solutions will be ironed out in this process. Hoey said that the negotiations had “seen a lot of negativity from the Irish government”. “Putting up barriers when perhaps they aren’t there. And you’re wondering why they’re actually doing that when actually it is in their interest to make this work,” she said. She said that she “resented the idea” that Brexit would threaten the peace process in Northern Ireland. Because I’m not sure who’s threatening it. It’s certainly not the people in Northern Ireland who want to leave the EU. Fine Gael senator Neale Richmond also spoke on the programme. He said that both the gardaí and the PSNI have warned that the peace process in Northern Ireland is under threat from loyalist and republican paramilitary groups. “To flippantly say there is no threat. There is a threat. Both the PSNI and An Garda Síochána have said there is viable paramilitary threat to the peace process,” he said. You put up one watchtower or put out one foot patrol and they will be a target and I would argue that they would be attacked within a week of going up. Hoey again called for Ireland to “be more positive” and said that the UK would not be paying for any hard border. “We’re not the ones who are going to be putting up the physical border. At the end if this ends up with a no deal we won’t be putting up the border, they’ll have to pay for it,” she said. Hoey went on to say that there was “a lot of politics going on” on the Irish side and that Fine Gael were “worried about Sinn Féin”. Richmond flatly rejected this. She also said that Ireland would consider leaving the EU in a few years after the country sees how successful the UK has been. Speaking this morning on RTÉ’s Today with Sean O’Rourke, Foreign Affairs Minister Simon Coveney said that Ireland has been asking for more clarity around the parameters by which the UK plans to solve the border issues. He acknowledged that some of this will be dealt with in phase two. He said it is “not credible” for the UK to say there will be a frictionless border, and maintain they will leave the Customs Union and the single market, and not give any assurances of regulatory divergence. If there are diverging regulations both north and south of the border, there will have to be customs checks, he said. There is no way of avoiding that. Coveney said if there are diverging regulatory regimes in areas such as agriculture, environment and so many other areas, it would be “impossible” to avoid a checking system and “some sort of a hard border”. The minister said it is not unreasonable for Ireland to seek such clarity. He said he met with Michel Barnier, as well as Donald Tusk and Jean-Claude Juncker on Friday, and Coveney was told they fully support Ireland’s position. On the issue of the veto, he said Ireland does not need to use it as Ireland has the full support of all the other member states. “We will not be moving on to phase two in December” if the border issue is not addressed, said the minister. Ireland is not going to be isolated and forced to use a veto. Email “Pro-Brexit politician says Ireland should be more positive and 'will have to pay' for any hard border”. Feedback on “Pro-Brexit politician says Ireland should be more positive and 'will have to pay' for any hard border”.